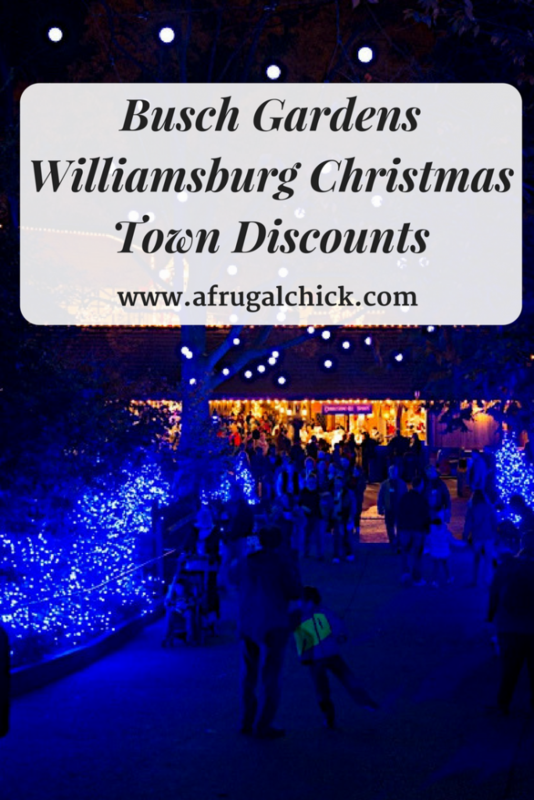 Busch Gardens Williamsburg Christmas Town Discounts- LIVE NOW! The Busch Gardens Christmas Town Tickets for 2018 are live now! As in previous years you must choose your date ahead of time to see the pricing for tickets. The more expensive the tickets the busier to expect the park to be. Prices are from $30 to $49. If you are going to do the $49 consider getting a Christmas Town Fun Pass. It’s $49 and you can go as many times as you like. November 16th through January 5th Busch Gardens Williamsburg VA transforms into the beautiful Christmas Town. It is one of my favorite events of the year. Not only is it super fun to attend with my family (my niece and nephews love the lights and there are still lots of little kid rides open) but if you go with someone special it can also be terribly romantic. I personally like going to Busch Gardens Christmas Town after Christmas Day because I feel like it makes the season last a little bit longer. Christmas Town Fun Card: $49 and available now. We don’t usually see a discount on the Fun Cards. Last year they didn’t even do a discount if you had a Season Pass. Christmas Town Single Day Ticket: The Busch Gardens Christmas Town Tickets for 2018 are live now! As in previous years you must choose your date ahead of time to see the pricing for tickets. The more expensive the tickets the busier to expect the park to be. Prices are from $30 to $49. Membership Members: Remember Christmas Town is now included in your pass so you don’t need to buy tickets! Single Day Tickets for Annual Pass Holders– $29 and you should be able to purchase logged into your account. Busch Gardens Christmas Town Fun Pass– $49 and available now. We don’t usually see a discount on the Fun Cards. Last year they didn’t even do a discount if you had a Season Pass. NEW Christmas Town Express  The familiar Choo Choo of the Busch Gardens Railway will signal an unparalleled experience around the worlds most beautiful theme park. Park guests can sing along to favorite holiday songs while enjoying the lighted decorations along the parks popular train route. The experience will feature festive caroling, two million stunning Christmas lights and themed holiday vignettes meticulously placed around the 1.5-mile tour. NEW Wilkommenhaus  Located in the parks German village, the Wilkommenhaus transforms into a fantastic visual Christmas spectacle through beautiful projection mapping. The sweet smell of Christmas treats from the Cookies & Cocoa Shop wafts through the air as virtual gingerbread men make this festive village come to life nightly, every 15-minutes during Christmas Town. NEW Sesame Street® holiday show: Elmos Christmas Wish Elmos Christmas Wish debuts this year on the stage at Sesame Street® Forest of Fun. Guests can enjoy this holiday musical show with Rosita, Grover, Zoe and Cookie Monster as they help Elmo find his Christmas wish. Santas Workshop  Children can meet jolly ol St. Nick at his workshop in the NewKastle building, take pictures and drop off their Christmas wish lists. Spectacular yuletide shows  A cappella show Gift of Harmony is back for its second year. Popular shows Twas That Night, headlined by former Olympic skater Elvis Stojko, Deck the Halls, Scrooge No More! and Gloria! also return, along with the popular 50-foot Christmas tree light show OTannenbaum in front of the stunning Das Festhaus. Rudolph the Red-Nosed Reindeer  The classic Christmas character is back and joined by friends Clarice, Yukon Cornelius, Bumble and Sam the Snowman. Guests can meet and have their pictures taken with the beloved characters at Rudolphs Winter Wonderland in Holiday Hills and enjoy a multisensory presentation of the timeless Rudolph story at Rudolphs Movie Experience. Sesame Street® Forest of Fun  Visitors can meet their favorite Sesame Street characters, including Elmo and Cookie Monster, and capture a special holiday photo. Families can ride Grovers Alpine Express and take time for some Christmas shopping at Abby Cadabbys Treasure Trove. Santas Fireside Feast  Christmas Town offers an assortment of special dining experiences, including Santas Fireside Feast, where Santa recounts a classic Christmas story while elves prepare a scrumptious all-you-can eat buffet and Mrs. Claus dazzles the dining room with holiday cheer. Children are able to visit Santa and get that all-important photograph as part of the experience. Christmas Town is a separate ticket not included with a membership or the Waves of Honor program. In the past there were certain days with very low cost passes ($9?) maybe it was a Black Friday special? Are there plans for that again? You have been added. I have a double opt-in to help with spam so you should have an e-mail asking you to confirm you want to join the list. Check out the “Celebrate Christmas” package. I JUST did the math for someone yesterday and it came out as much cheaper than doing everything individually. yep planning to stay there for 3 days with hotel for the kiddos, was thinking if its cheaper to just book a package with busch garden rather than doing a diy route. Do you need a hotel and such? What types of packages are you asking about? do you have recommendation for packages? What are the best days you recommend going to Christmastown this year? Sundays? Christmas Eve? Does the Colonial Bounce ticket include everything at regular Christmas Town? It seems with two kids under 5, that might be our best deal since the kids tickets are free with adult purchase? Even if we don’t plan on using the Colonial part. Hey, what are the exact dates we are able to use the pass? I had gotten the twinkle pass deal. Thank you. We purchased the Twinkle Tickets and can’t wait to go. The kids love the hot chocolate and would love it even more if they each had their own cup! It’s usually on the VERY first page. On the left hand side. I’m trying to use the coupon code to purchase tickets online but I can’t find a place during the checkout process to add the promo code. Any ideas? Would love to be sipping hot chocolate from one of the mugs while visiting Christmas town this year!! I always look forward to seeing you on the Sunday morning savings segment of WVEC news. It’s so much fun to get a bargain and thanks to you I know where and how to do it! I was able to purchase the Twinkle Town tickets this year for me and my husband. We have only been to Christmas Town once before a couple of years ago. Our children and now grown and although it was just us we had a wonderful time. My favorite part was enjoying all the beautiful lights! When we go this year, I look forward to the show you recommended and will definitely take your advice and reserve our seats. Thank you again for all your hard work and how much it helps us all save! Hi Laura I love seeing you on Wavy10 on Sunday mornings and really have taken advantage of lots of great deals in the newsletter! Took advantage of the $14 dollar Christmastown tickets for my family, we have no family nearby and my daughters thought it would be great to go on Christmas Eve, we’ve never been and as they are a Senior in High School and a college Sophomore I know we will all have a magical time! Thanks, Laura! Look forward to checking out Christmas Town! I really like seeing the program at the fest haus. Last year 2014, was my first year going and it was amazing… all the lights on the tree in italy by the battering ram was awesome too. Busch Gardens is flipping the price of those tickets around like crazy. This weekend the price has changed five or six times. So if you don’t want the $14 tickets make a note to keep an eye on it today- the price may drop back down. Am I missing something. When I click “this link” for the $24 day tickets it goes straight to $35 tickets. I don’t see any promo codes. Also, at the end of your segment on the news, please repeat your website name again. These will be the cheapest tickets available. Last year he was there when I went on the 29th. Do you know if the Twinkle Tickets are taking the place of the Twelve Days of Christmas promotion they did last year? And do you know how long Santa is there for pictures, will he be there for pictures if we went after Christmas? The only coaster that stays open is Verbolten. The bulk of the smaller rides remain open. Sesame Place is closed. I’m just trying to find out info on Christmas Town since we have never been… Do rides stay open during this event?? Specifically roller coasters? Any info you can give me will be great!!!! Thank you!